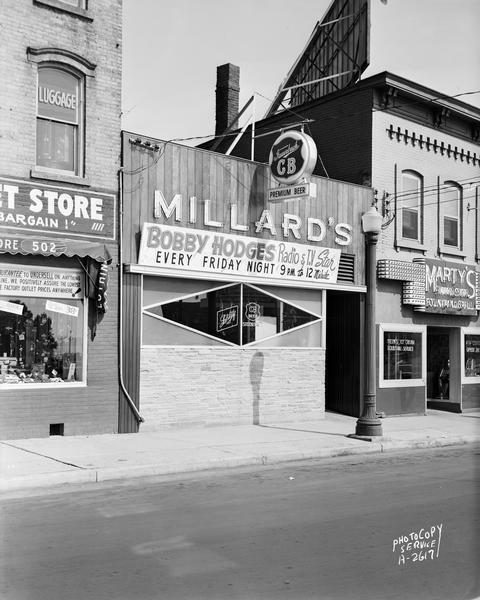 Millard's Tavern, 504 East Wilson Street with Fauerbach CB beer sign and "Bobby Hodges radio & TV star, Every Friday Night". Also shows Marty's Sandwich Shop, 506 East Wilson Street and Factory Outlet Store, 502 East Wilson Street. Millard's Tavern was later the home of O'Cayz Corral, which was destroyed by fire on January 1, 2001.